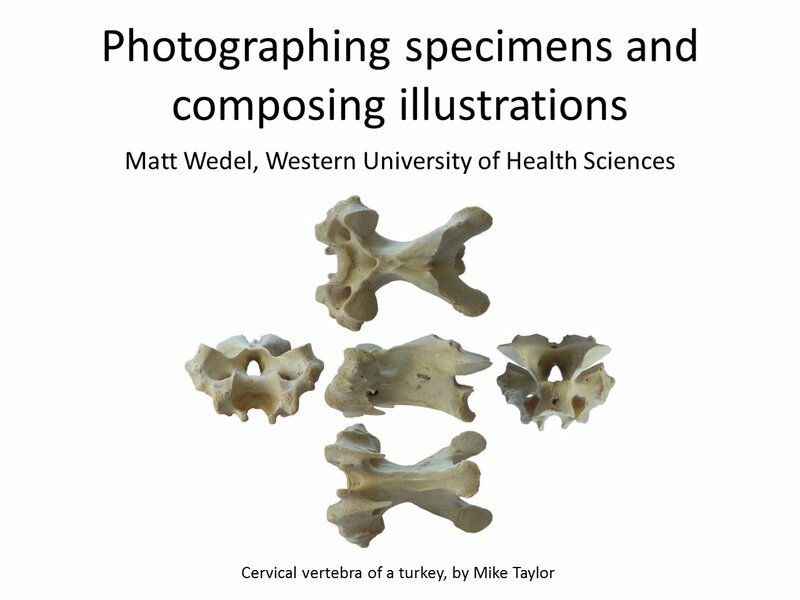 Recently I had the opportunity to give a talk on photographing specimens and preparing illustrations in Jim Parham‘s phylogenetics course at Cal State Fullerton. Jim is having each student (1) write a description of a specimen, (2) run a phylogenetic analysis, and (3) do some kind of calibration on their tree. I think that’s rad. Anyway, it was fun talk and I wanted to put it up for everyone, but Mike had the idea of posting a batch of slides at a time, to hopefully fire some discussion on different aspects of photography and illustration. So if you’re impatient to see the whole thing, blame him! I will post the whole talk at the end of the post series, and you can find all of the talk posts here. 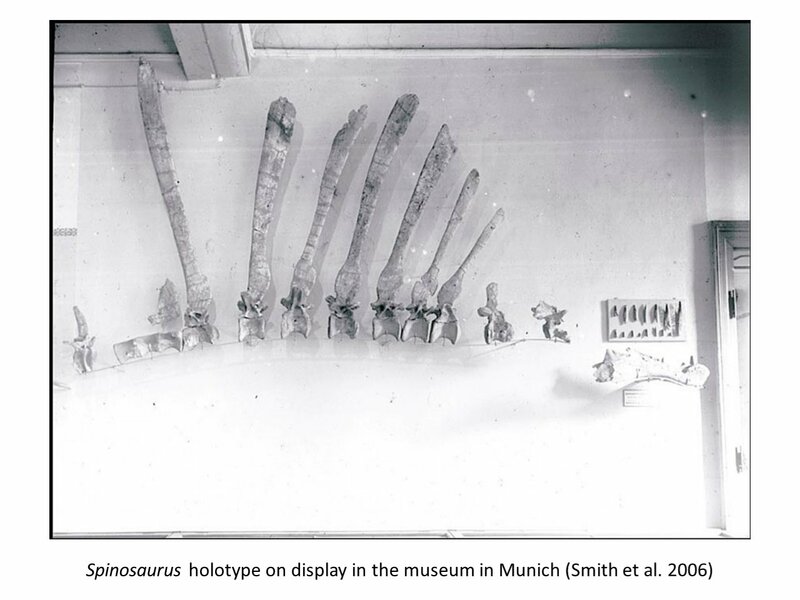 Note that the material found in the 1990s and 2000s shown above is rostra (premaxillae and maxillae): material not illustrated (and almost completely absent in) Stromer (1915): their referral to Spinosaurus was based on comparison with Baryonyx and other spinosaurids bearing both rostra and dentaries associated (allowing a comparison with Spinosaurus type dentary), not on direct comparison with the 1915 pictures. Yes, shame about the facts indeed. BUT the key point here is one I’m very keen on, which is that the goal of a good description should be to come as close as possible to being a proxy for the specimen itself — a proxy that can easily and safely be sent around the world. As recently as ten years ago, that felt like a distant dream for most descriptions, which tended to be compressed to fit journals’ length limits and be epically under-illustrated with a couple of two-inch-square black-and-white images. Whereas now it’s not even unusual any more for new taxa in megajournals to be described in loving detail and illlustrated with sixteen figures consisting mostly of big, colourful multi-view photos. In effect, good descriptive papers in megajournals are now the equivalent of monographs. It’s one of the undervalued benefits of the shift to electronic publishing. …after some reflection, I realize that I should not have capitulated so quickly. Emphasis mine. The other spinosaurids were recognized as spinosaurids because they had Spinosaurus-like snouts, not sail-backs (at least not the earlier discoveries). 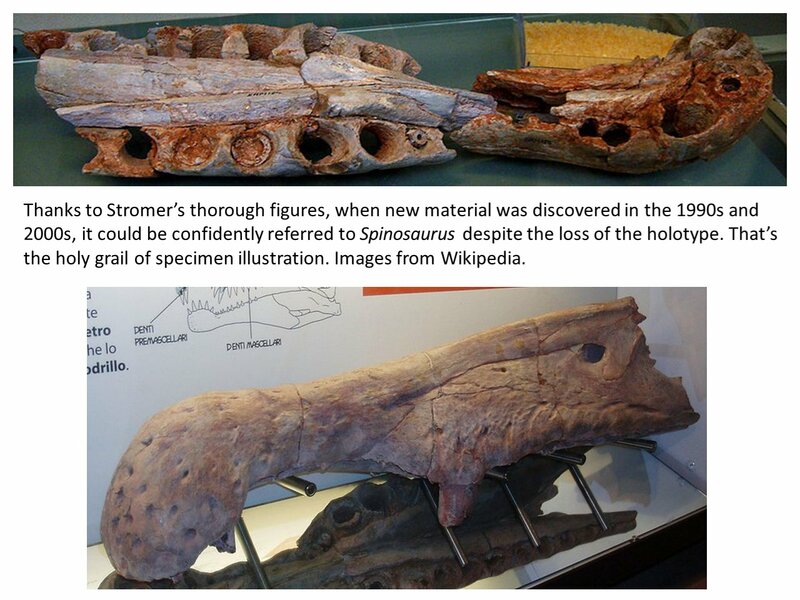 And they could only be recognized as Spinosaurus-like because Stromer had done such a good job of illustrating Spinosaurus. 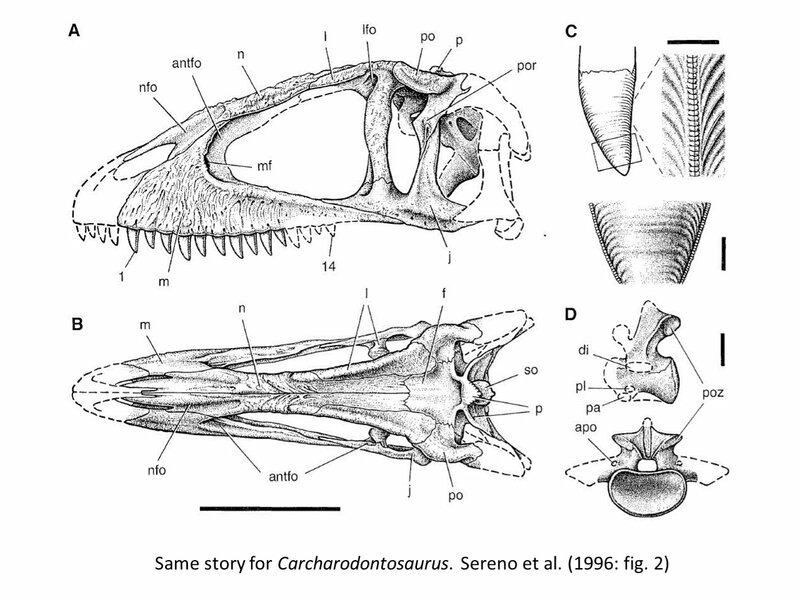 So whether the new Spinosaurus material was recognized as such because of direct comparison with Stromer’s illos or indirect comparison via taxa that were known as spinosaurs because of Stromer’s illos, Stromer still gets the win here. Matt, in fact, I included that “allowing comparison with Spinosaurus” to remark that the main message of your post was valid. 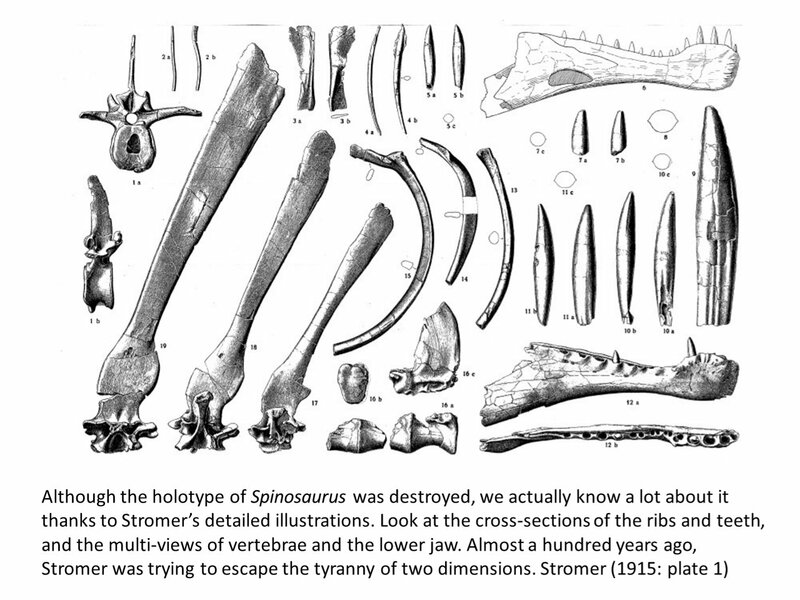 PS: Stromer is one of my heroes (http://theropoda.blogspot.it/2013/08/the-lord-of-giant-theropods.html). I’ve much appreciated this SVPoW post. Thanks for sharing these photographs. 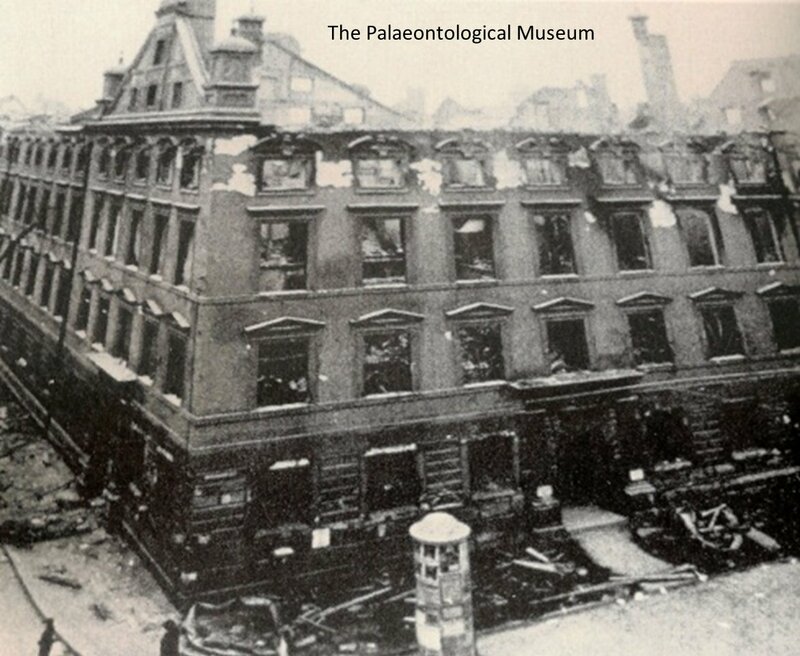 I haven’t seen the ones showing the totally destroyed museum before. Much of what was collected at Baharija by Markgraf we only know so well because not only were the illustrations so thorough, but the technical writing was so superb. 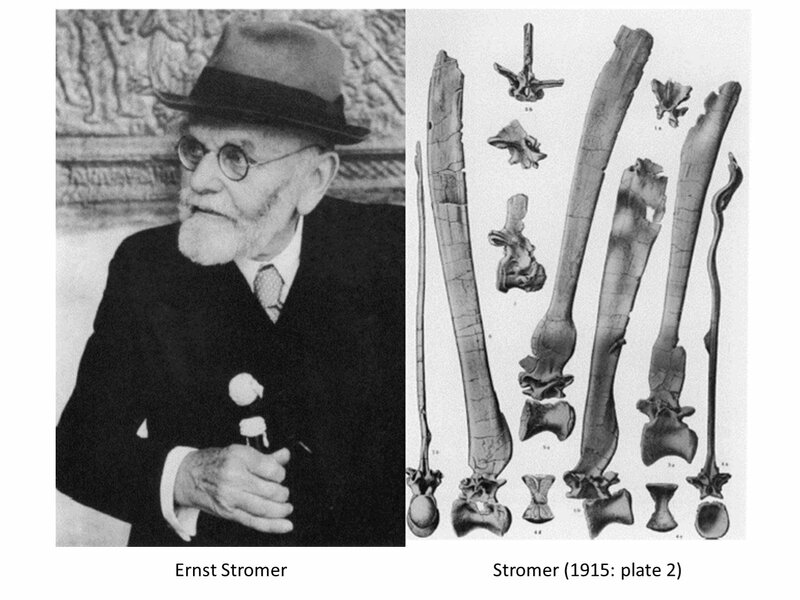 Von Stromer was VERY thorough, a fact which means we can use not just the inkwash illustrations but also his description to tell us information about the specimens that were destroyed. 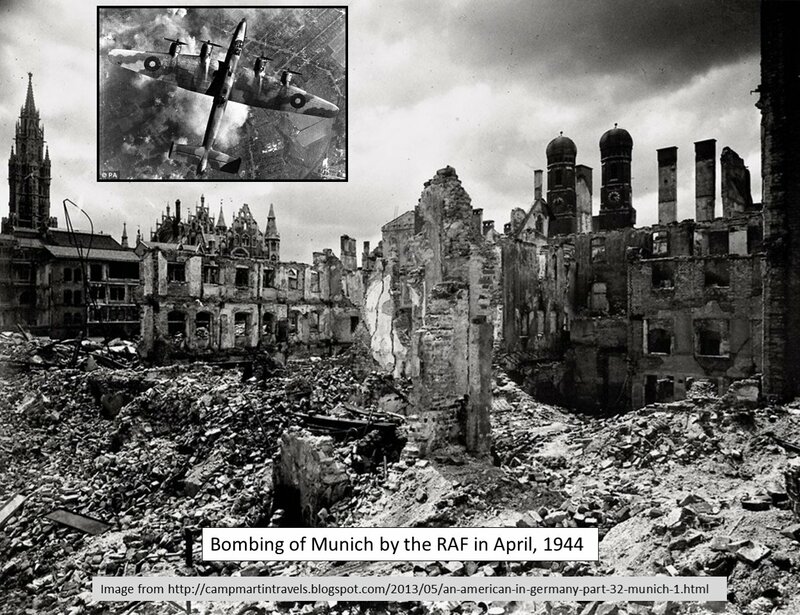 Similar work went into the Tendaguru material by Janensch, the stuff that didn’t survive bombing, though with more ink drawings, less inkwash. I Know it s a “stinkin’ theropods” but Someone knows so e details about the Carcharodontosaurus vertebra?